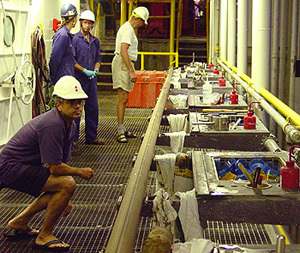 James Zachos (foreground) inspects a sediment core drilled from the ocean floor. Photo courtesy of J. Zachos. Zachos and his collaborators have been studying marine sediments deposited on the deep ocean floor during the PETM and recovered in sediment cores by the Integrated Ocean Drilling Program. He will discuss their findings, which reveal drastic changes in ocean chemistry during the PETM, in a presentation at the annual meeting of the Association for the Advancement of Science (AAAS) in Boston on Friday, February 15. His talk is part of a symposium entitled "Ocean Acidification and Carbon-Climate Connections: Lessons from the Geologic Past." The effect of ocean acidification on the chemistry of calcium carbonate is reflected in the sediment cores from the PETM. Marine sediments are typically rich in calcium carbonate from the shells of marine organisms that sink to the seafloor after they die. Sediments deposited at the start of the PETM, however, show an abrupt transition from carbonate-rich ooze to a dark-red clay layer in which the carbonate shells are completely gone (see earlier press release). Note to reporters: You may contact Zachos at (831) 459-4644 or jzachos@pmc.ucsc.edu and Ravelo at (831) 459-3722 or acr@ucsc.edu.